Comparisons between Trump's border regime and the Nazi genocide often obscure more than they reveal about white supremacy, past and present. Photograph of Ursula child detention center in McAllen, TX provided by US Customs and Border Protection to reporters, who were not allowed to take photos. via Wikimedia Commons. In the United States, the Holocaust analogy is a rhetorical device that is always close at hand. It seems there is no more evocative illustration of the social, political, and racial psychologies of a people willingly led down the path of white supremacist authoritarianism. Drawing historical lessons into the present is a worthwhile exercise, but also worth considering is how the impact of these lessons can be cheapened by oversaturation. The Shoah itself ended, but both the trauma it created and the antisemitism that fueled it endure. In the hands of those who refuse to recognize contemporary antisemitism, the analogy frequently reproduces the very structure we seek to try to caution against. And in the same breath it is invoked, the legacy of the Holocaust is often misconstrued. Even as the United States is likened to the Third Reich circa 1933, we cling to mythologies of fascism as the product of singular, charismatic leaders (seeing Adolf Hitler or President Trump as dupers of the white working class through force of personality) rather than understanding how existing political structures in each country — the latent elements in their political systems rooted in exclusionary white nationalisms — were susceptible to creeping fascist erosion. The analogy is seductive in the near universal horror it summons, not only because of the monstrous scale and nature of the genocidal atrocity but also because of how we misunderstand antisemitism. For so many, the power of the comparison is driven by the retrospective understanding of twentieth-century German Jewish communities as “white” and “European”: at the time, they were regarded as neither. The Holocaust is a moral wound on the American sociohistorical psyche as it well should be. But that wound remains superficial while contemporary American antisemitism (including from the present administration) goes unchallenged, and continues to inform our collective ethic around racialized seeing. Racialized seeing describes our capacity to register with social violence enacted upon subjects that exist outside of whiteness. The endurance of this kind of Holocaust rhetoric thus emerges from our disbelief that such violence could ever be enacted against bodies we presently code as white. The analogy becomes easy and even necessary to make when the government itself offers it freely. Sean Spicer’s Freudian slip that Hitler did not use gas “on his own people” was no mere gaffe: it revealed a shared logic of white biological citizenship. Tens of thousands of the Jewish people killed in the Holocaust were German citizens. But per Nazi racial policy, they were not and could never be German. The 1930s American immigration regime, bolstered by widely circulated eugenicist policy, buttressed these Nazi claims of a biologically essentialized citizenship, as did the American rejection of thousands of Jewish refugees fleeing Europe. The acknowledgment of human suffering is never a zero-sum competition. A reliance on Nazism as the pinnacle of exterminatory violence effectively renders violence against non-white bodies illegible. And this becomes something of a soft historical revisionism when we consider not only the non-white status of German Jews, but also the Holocaust victims omitted from our collective memories: notably, Romani peoples who were marked as “asocial” people with “alien blood” and who were similarly made enemies of the German state. Beyond distorting the Nazi genocide itself, these analogies typically turn attention away from the internment, containment, and extermination structures upon which Hitler based his concentration camp apparatus. The structure of Nazi genocide was based on American westward expansion and the Native American reserve systems necessary for indigenous land expropriation; the detention of Ethiopians during the Second Italo-Ethiopian War (1935-39); Lord Kitchener’s British imperial campaign and concentration camp detainment of the Boers during the Second Boer War (1899-1902), which spawned the first popular usage of the term “concentration camp”; and, nearer to home, Germany’s genocidal race war waged against the indigenous peoples of South West Africa/Namibia during the Herero Wars (1904-1908). 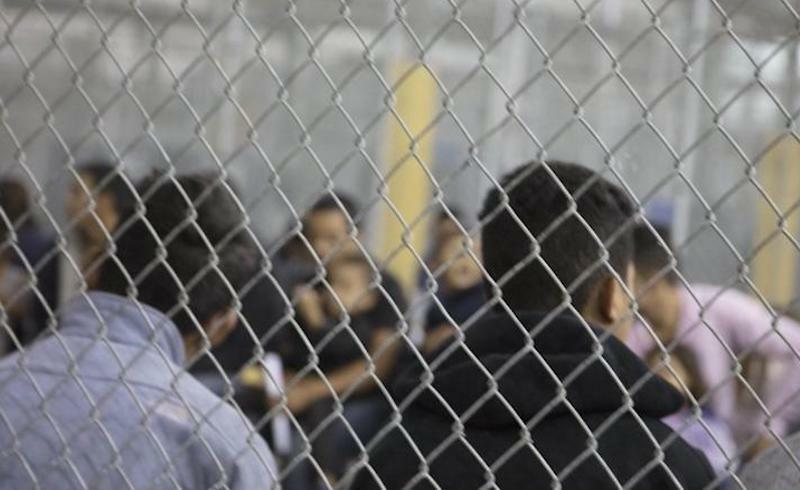 The photographs now circulating from the American government’s child containment facilities (a phrase that still feels unbelievable to write) are the latest object of the this analogy, which compares them to concentration camps and Jewish ghettoization. These comparisons accompany the often-shared “Ten Stages of Genocide” schema, which locates this country’s containment policies well into the dehumanization and organization stages. These references are not not inapt, but they sometimes relegate more direct American precedents to an afterthought: Japanese internment during the Second World War and the United States’ long legacy of separating Black and indigenous children from their families, enduring practices reflected in often racially abusive contemporary foster care. The insistence that “these are not American values!,” or that “it could never happen here!,” accompanied by a quick turn to Nazi Germany, illustrates the depths of racial denial and our refusal to see this country’s repeatedly demonstrated capacity to harm communities excluded from the American social contract. This gesture places ethno-racial struggles into competition, making it difficult to understand how our struggles under whiteness are co-constructed. There are deservedly dozens of Holocaust memorials and museums across the United States; America’s very first lynching memorial, the National Memorial for Peace and Justice, opened on April 26th of this year. The production of atrocity media is memetic in this cultural moment. Black death by police is on autoplay, we waded regularly through images of injured and war-weary Syrians (and Iraqis and Afghans before them), and the sights of dejected migrants and sounds of wailing children stripped from their parents form landscapes and soundscapes of previously unknowable trauma and unfathomable cruelty that can only register after documentary proof. These pathos-inspiring images need not even be accurate because of the narrative interchangeability and poorly understood nature of non-white suffering. It was recently revealed that Yanela, the little Honduran girl whose crying image has become synonymous with the Trump administration’s child separation policy, was never actually separated from her mother. But the photograph had already made its rounds, eventually landing the cover of Time magazine, a “Napalm Girl” for the social media age. Writing on the performative function of the dissemination of Abu Ghraib photographs, Peggy Phelan troubles the affective politics involved in visualizing an atrocity in progress compared to the ongoing reckoning with a historical one. The need to visualize these camps, like the emergence of those haunting prison images in 2003, is a product of “the urgency of the present tense”: to depict them visibilizes an active zone of non-being, a carceral location — a border, a 100-mile border zone, a containment camp, a CIA black site — that defies imagination. But, as Phelan also noted of the response to the Abu Ghraib photos, our own nationalist moralizations about the photographs’ content — “This is un-American!” — become the focus rather than the racial violence and border imperialism that underlie their production. After all, one apparently acceptable solution to the family separation policy and the call to #KeepFamiliesTogether is a “compromise” to indefinitely detain families together. Although the call to abolish the teenage ICE institution is slowly becoming a rallying cry even among progressives who once derided the prospect as fantastical (though their “abolition” is clearly pre-2020 electioneering rhetoric that would recreate a “friendlier” enforcement agency), the slight modification makes ongoing corporal violence against non-white bodies once again palatable to many. The horror of child detention lies, of course, in the unimaginable evil of tearing children away from their families (an action that offends the centrality of the nuclear family in the United States). A number of these children have gone on to represent themselves in court, a visual as preposterous as the violently xenophobic nature of the immigration system itself. But as popular challenges to ICE grow in number, there is often failure to situate the institution as a part of so many other fundamentally illegitimate organs and functions of the settler state. ICE cannot and does not exist without the cooperation of state and local law enforcement, so a singular focus on ICE will be largely cosmetic without a politics in opposition to broader border imperialism; the maintenance of which by US Customs and Border Protection has killed an unknowable number of people, including migrants shot at the border like Claudia Patricia Gómez Gonzáles, a 19-year-old indigenous Guatemalan woman. The horror of the Muslim Ban is a continuation of the Bush administration’s post-9/11 securitization of Muslim communities, which cannot be separated from anti-Black carceral violence because among the first Muslims in America were enslaved West Africans (referred to frequently as “Moham(m)edan slaves”). It has precedent, too, in the 1882 Chinese Exclusion Act, an order prohibiting the immigration and naturalization of Chinese workers, the first ever law preventing a specific ethnic or racialized group from entering the country. 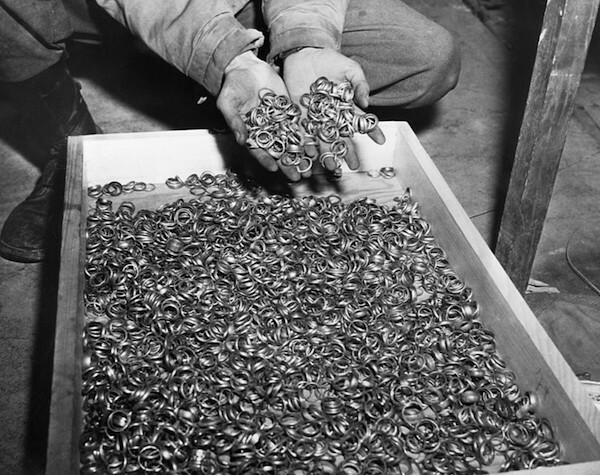 Some of the thousands of wedding rings the Nazis confiscated from Jewish detainees for gold salvaging, found at Buchenwald by US army soldiers. (1945). 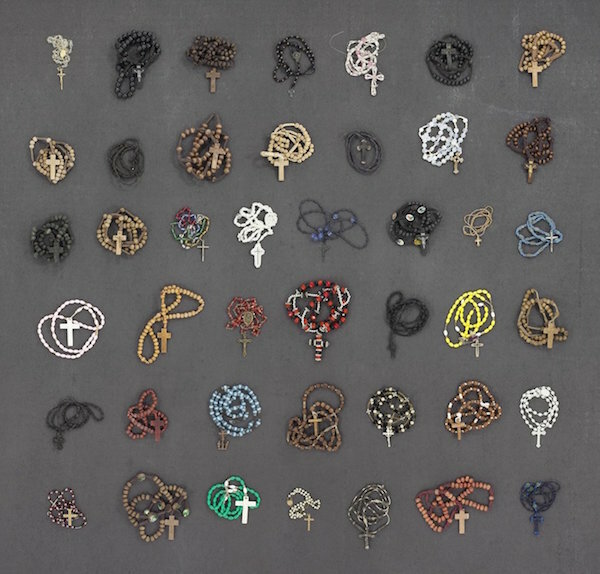 Rosaries confiscated at the Customs and Border Protections processing center in Ajo, Arizona (Thomas Kiefer). If children like Yanela are only visible through the attempt to imagine our own children being stolen and our own families being ripped apart, we become able to pretend that routine dehumanization is not a familiar and foundational aspect of American racism, which then becomes invisible. Because white racialized seeing is largely trained to focus on a single issue at a time, it sees and protests detained Central American migrant children while failing to see and protest against the quotidian practice of holding non-white children in juvenile detention. Violent images steadily dehumanize through spectacularity. Real suffering, then, can only be grand and consumable and retweetable; the pedestrian and processual experiences of social death and unpersoning, the embodied effects of mundane racial terror and psychological violence, the inheritance of trauma in successive generations cannot be so readily cannibalized. Some of the most devastating photographs are ones depicting a quiet suffering, leaving a visual absence that compels us to empathize and imagine the unimaginable. Migrants are often stripped of personal effects at the border. Children’s toys, a means of self-soothing, are confiscated. So, too, are their shoelaces, which could be used as tools for self-harm and are also deemed as non-essential (Yanela’s mother had unlaced her daughters shoes shortly before John Moore captured the photograph). In a New Yorker profile of Tom Kiefer, the US Customs and Border Protections janitor who curated and photographed these seized items, he describes how finding them in the garbage and realizing they would never be returned fundamentally changed his relationship to his employer. One of his photographs shows the rosaries he found. In all of the horrors involved in immigrant detention experiences, there is something particularly sinister about taking away a source of resilience and the promise of a greater justice in the afterlife. He quit his job to focus on his photography. Zoé Samudzi is a Black feminist writer and doctoral student in Medical Sociology at the University of California, San Francisco. She is co-author, with William C. Anderson, of As Black As Resistance: Finding the Conditions for Liberation.